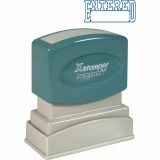 Xstamper ENTERED Open Space Title Stamp - Xstamper blue ink "Entered" Title Stamp is pre-inked for 100,000 impressions and re-inkable for 100,000 more, again and again. Patented cellular inking process delivers cleaner, more consistent impressions. Retractable frame keeps stamp surface away from desktop until ready to use. 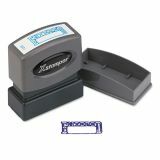 Impression size is 1/2" x 1-5/8".